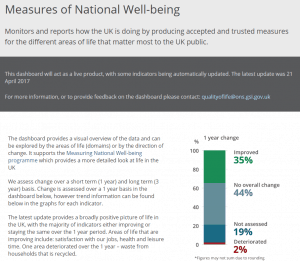 Six years of personal wellbeing data released: how are we doing as a nation, and in your area? Today the Office for National Statistics publish their sixth annual update on the figures for national wellbeing. Chris Randall, Quality of Life, Office for National Statistics, summarises the findings; breaks down what it might mean for your local area; and offers the interactive tools for you to explore for yourself. Since 2011, we have asked personal wellbeing questions to adults in the UK. This provides insight into people’s feelings about their lives and surroundings which economic statistics by themselves, such as GDP, do not provide. It is hoped such information supports better decision making among policy-makers, individuals, communities, businesses and civil society. Today we have released the sixth annual update to personal wellbeing. This presents headline estimates at a UK and country results along with local authority breakdowns for the year ending March 2017, together with how things have changed over the six years of collecting this information. What’s important about the data? As well as looking to provide estimates of personal wellbeing to the lowest level possible – it is also important to consider differences between those reporting the lowest and highest levels of personal wellbeing. It is also important that we consider any inequalities between groups. Over the year that this publication covers, various situations of uncertainty, not least in political terms have unfolded in the UK. This highlights why it’s essential to measure personal wellbeing. How is my area doing? The local authority personal wellbeing estimates released today have an interactive map and explorer, which allows for exploration of personal wellbeing in your area. You can also compare it to other areas and track changes over time. The What Works Centre for Wellbeing has also recently published a local wellbeing indicators set and guidelines. These provide a helpful starting point for looking at issues that contribute to wellbeing in local areas. 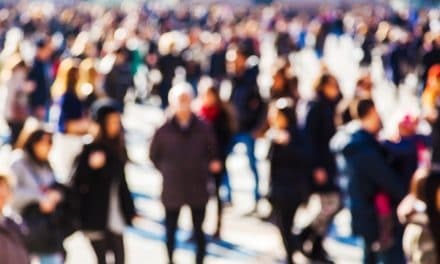 ONS is looking at what causes people to report low measures of personal wellbeing by identifying groups of individuals that share similar characteristics and looking at the factors that determine their reported low wellbeing. We are also hoping to release some analysis towards the end of the year looking at how personal wellbeing ratings compare between UK and non-UK nationals. Are the measures of personal wellbeing all there is? Not at all – there are actually 43 national wellbeing indicators, which include our health, natural environment, personal finances and crime. Our interactive dashboard shows trend data for each measure alongside an assessment of change over time. Guest blog: How do Mental health non-profits use evidence ? Sport, dance and young people's wellbeing: what works?